Image yourself traveling through a village of northern Karnataka, you come across a group of acrobats, women wearing color full embroidered attire, singing and could also be selling skillfully crafted leatherwork, they are the group of banjara, One of the commonly known banjara tribe are, lambani. Lambani’s visit village’s mainly to satisfy their economic needs. Their goods tied to donkey’s back, selling spices, honey, grains and rare medicinal herbs. Out of few tribal group of northern Karnataka, lambani’s are migrating towards the urban area. The word banjara mean people who wonder in jungle and forest, word banjara is derived from Sanskrit word vanjara, van means jungle and jara means wondering. Apart from the minor forest produce they also sell salt to the local villages. 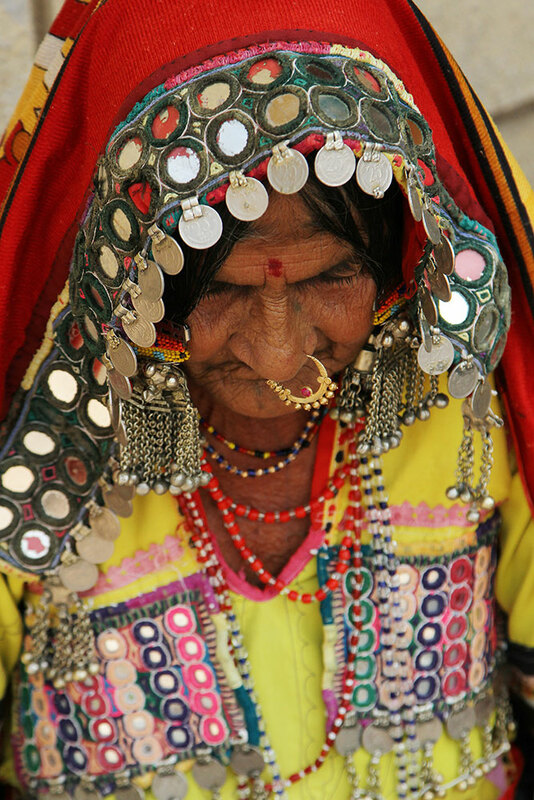 It is believed that the total population of lambani’s in India is about 30 million and they are descendants of the roma gypsies of Europe who migrated through Afghanistan and settled in Rajasthan. In the 14th century, lambani’s moved to south of Deccan who were a major part of Aurangzeb’s invading army. Each lambani’s tribe owned about 50,000 to 60,000 cattle and they generally worked as a source of transportation for the mogul army, carrying provision and arms with ease. As the war ended in south of Deccan, the lambani’s settled in the southern region and they continued to serve British and tipu sultan. Business of lambani’s come across a hurdle when the major parts of India was connected by the networked road 150 years ago, this forced lambani’s find customers in the interior of India, which were very remote in nature and then these wandering visitors began to be looked at with suspicion. During the British ear under the criminal tribe’s act of 1871, they were under high suspicion because British feared that were hired as spy from the other ruler in the country. However in 1952 Govt. of India de-notified them. Lambani’s came across a lot of problems, the primary problem was the connectivity of roads, then the law and finally nineteenth century droughts critically affected their lifestyle. They formed groups also known as “tandas” and they were named after the region at which they settled. Their only option to earn bread and butter was agriculture and it contributed towards main revenue. Landless lambani’s especially men as opted to work as day time labour and women opted for creating traditional dress and leather items. It is believed that, lambani do not have any official language, as they travel from place to place, they learn and add new words into their vocabulary, and hence it may happen that, each lambani tribe might have some set of new words which might differ from other. They have their own political system which is known as Goar Panchayat. The Head of the panchayat is known as Nayak (Headman), their political system follows Goar Boli (language of Goar). It is believed to be originated from the Indo-Aryan family and many of the words borrowed from Persian, Hindi, Sanskrit, Marathi, Gujarati, Kannada, telugu and even Persian. Goddess Shakti and her various incarnations are being worshiped by the lambani’s. Their social get together consist of Rick folk Dance, which are generally known as teej, lengi, kikli, rain dances they are performed at the time of marriage. Lambani community which possess very rich culture have been facing a lot of economic problems. 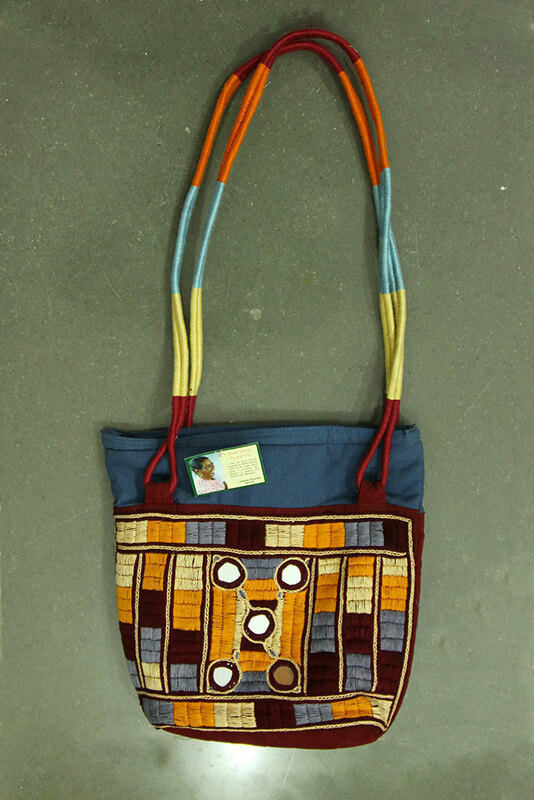 Their day to day expenditure has forced them to adopt laborers jobs leaving behind their traditional art. Most of the tribal groups, who have nomadic heritage, try to stay isolate from the modern world. Lambani women have a major contribution in keeping the rich cultural craft alive through their costume, which could be considered as one of the most colorful and elaborate of any other tribal group found in India. 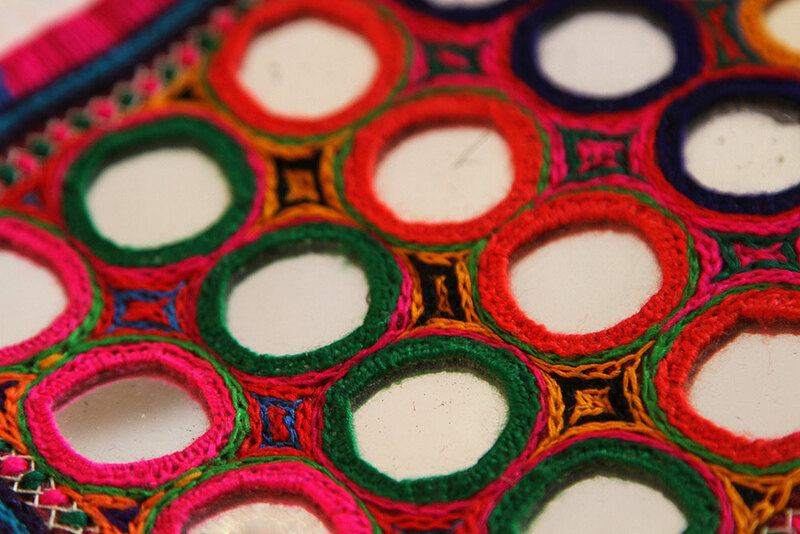 The unique combination of embroidery and mirror craft is been practiced by the lambani women, who are making these traditional wear for their own wedding or to gift it to their daughter on their wedding. Embroidery work by lambani generally consist of cross stitch, mirror work, darning, quilting stitches with of kangura patchwork applique on dark blue or red handloom base fabric. 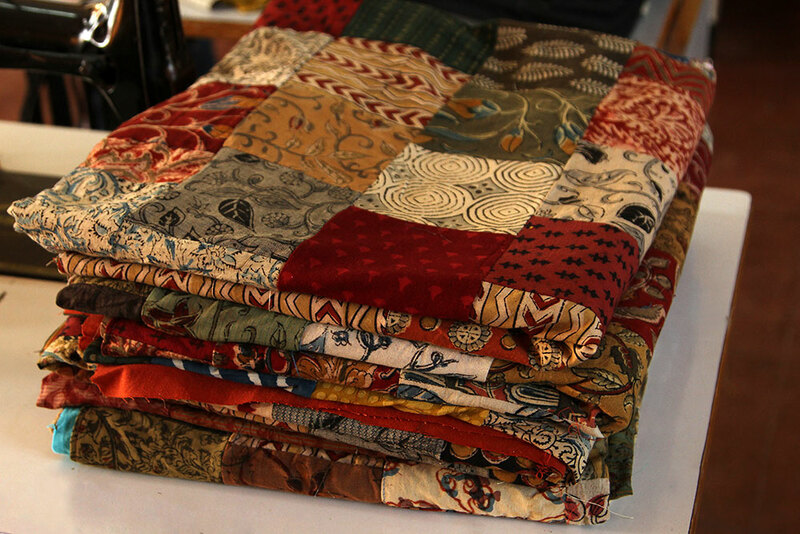 The 14 types of stitches used in Lambani embroidery are Kilan, Vele, Bakkya, Maki, Suryakanti Maki, Kans, Tera Dora, Kaudi, Relo, Gadri, Bhuriya, Pote, Jollya, Nakra. Sandur kushala kala kendra was promoted and sponsored by Shri M.Y. Ghorpade in 1984, it is a nonprofit center which works towards uplifting and introducing traditional crafts of village to national and international level. The institute also provides infrastructure to the artisan and help them sell their product by providing market support, Consistency of quality, innovative designs and working with market expectations has been a key factor that has contributed to the success of the Sandur project indigenously. 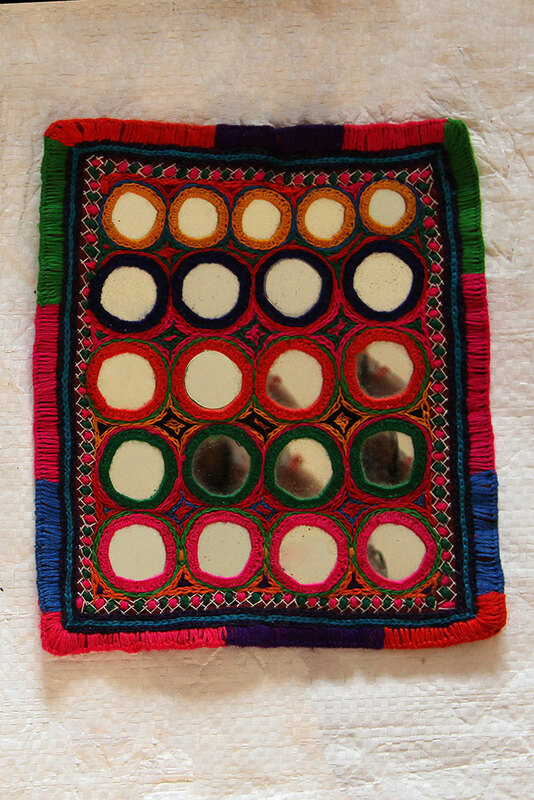 • Embroidery and Mirror work. • Cane and Bamboo Products. • Stone Sculptures and Wood Carvings. • Cotton Khadi Spinning & Weaving. Currently the institute funded by Sandur Manganese and Iron Ore Company to preserve the traditional craft of lambani. 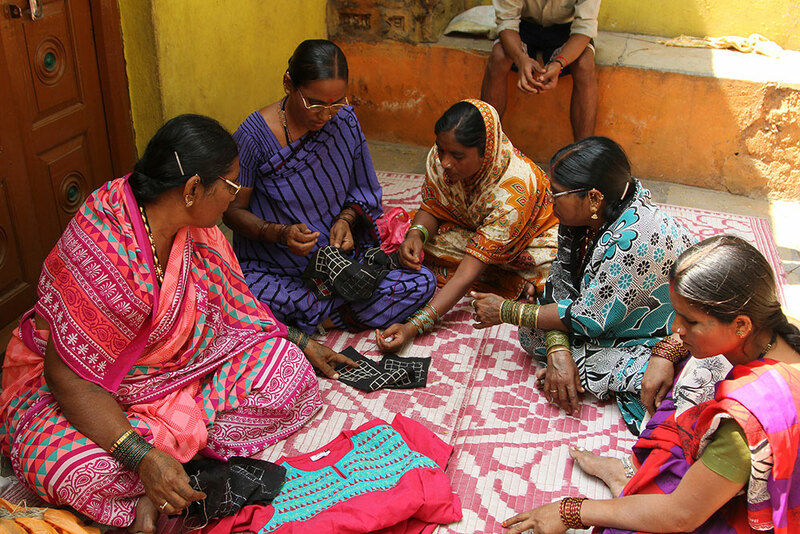 Artisan are given Rs.500 ration per month and they are also equipped with sewing machine.